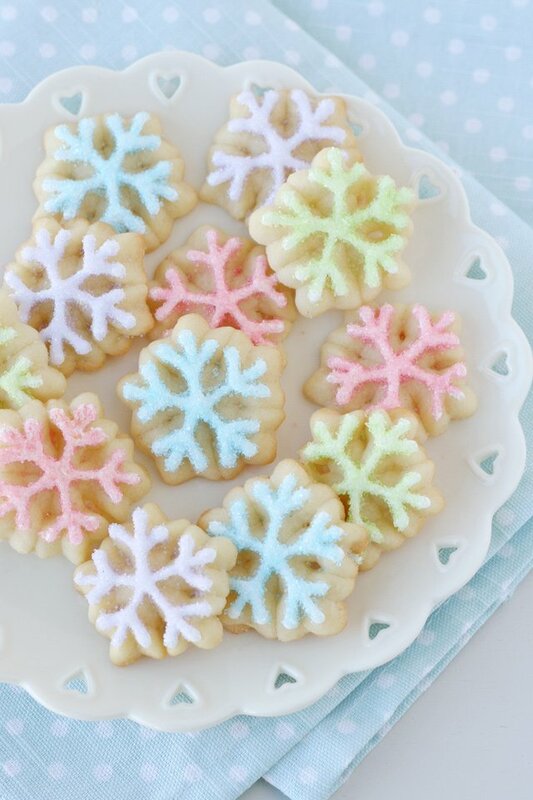 These pretty little Spritz Snowflake Cookies are the perfect treat to kick off the holiday baking season! Where I live in California we don’t usually see much snow (thankfully we can drive just a bit to find some to play in). But I don’t need real snow outside to have lots of pretty snowflakes in my kitchen! 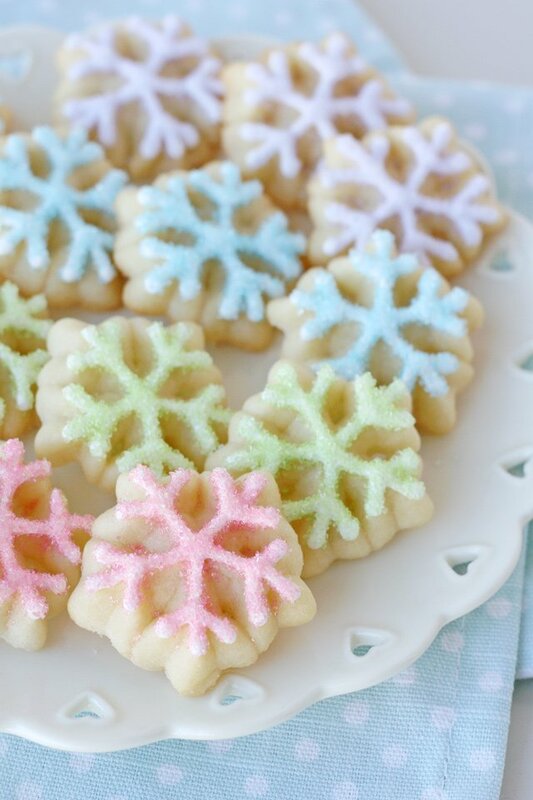 These sweet little snowflakes are just a dressed up Christmas favorite… simple spritz cookies! This buttery and delicious holiday favorite is perfect when you want to make a bunch of cute cookies… without rolling and cutting out individual shapes. 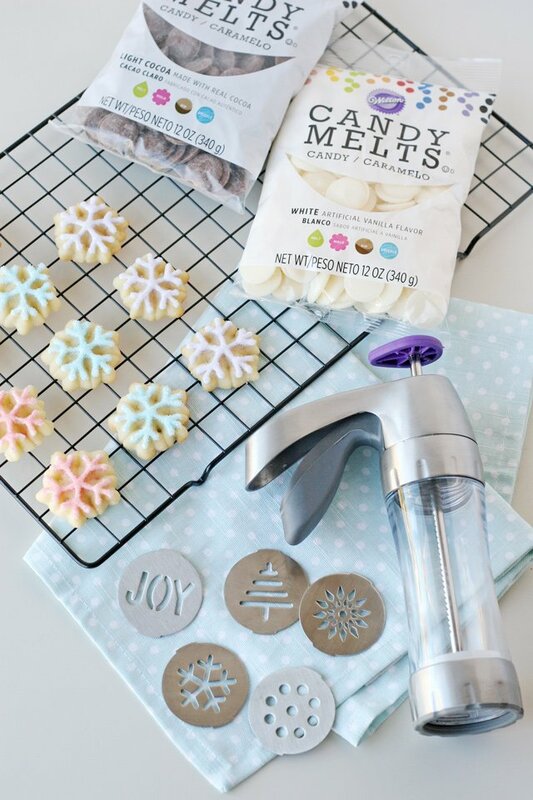 I created this post in partnership with Wilton and I’m excited to share some of my favorite Wilton products and ideas to help make your holiday baking a success! As much as I love making decorated cut-out cookies, the whole process is quite time consuming! 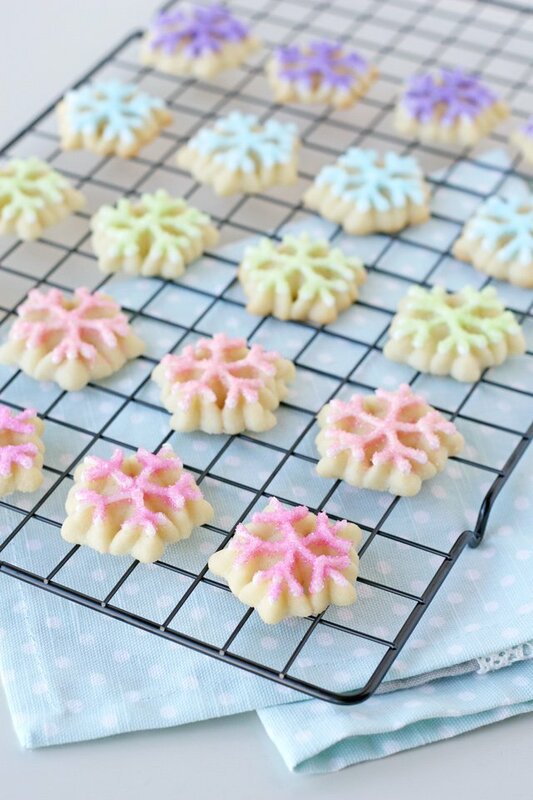 I recently discovered the Wilton Preferred Cookie Press and this adorable set of Holiday Spritz Cookie Discs and was so excited by how many delicious little cookies I could make in one afternoon! 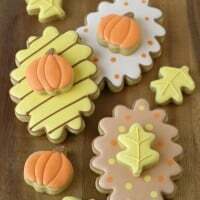 Just select the disk design of your choice, fill the cookie press with dough and with one little click of the trigger, you have a perfect little cookie shape! One batch of dough makes about 100 cookies and it’s easy to switch out the disk design as often as you like. There are so many cute design choices between the disks that come with the Cookie Press and the additional Holiday Discs, but I just fell in love with the perfect little snowflakes, so I just went to town with them! I have a “thing” for pastel colored sweets so I went a little non-traditional and had fun with lots of pretty Wilton sugar sprinkles. 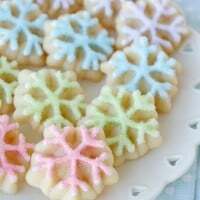 These spritz cookies are delicious on their own, but you can get creative with Wilton Candy Melts by dipping the cookies, or adding some melted candy melts to a disposable piping bag and adding some pretty details. The Wilton Candy Melting Pot is perfect for melting the candies and keeping them at the perfect temperature. The candy melts cool quite quickly (on the cookies), so be sure to add sprinkles immediately to any details you’d like to have some extra sparkle. As an alternative, you can make a batch of royal icing to add details to the cookies. 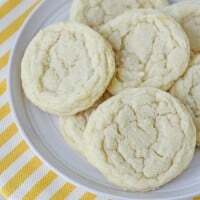 This classic buttery sugar cookie recipe is specifically designed to used with a spritz cookie press. In a medium bowl combine the flour and baking powder and set aside. In the bowl of an electric mixer blend butter until smooth. Add sugar and blend until the mixture is light and fluffy. Add egg, milk and extracts. While slowly mixing, gradually add flour mixture. Blend just until all of the flour is incorporated and the dough is smooth. Do not chill the dough. Fill cookie press barrel with dough and fit with desired discs. Press cookies onto an ungreased baking sheet. Bake cookies 9-11 minutes or until the edges are light golden brown. Cool a couple minutes on the baking sheet, then carefully move to a cooling rack to finish cooling. 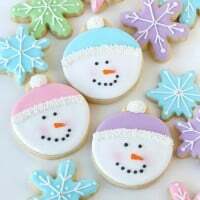 Decorated cooled cookies as desired. Bake cookies on ungreased aluminum or stainless steel baking sheets that are not coated with a non-stick coating. Do not use parchment paper or Sil-pat liners. The cookies need to be able to grab onto the baking sheet a bit to release properly from the spritz press. Do not refrigerate the dough, the dough needs to be soft to squeeze through the shape disc. Looking for more Christmas Spritz Cookie ideas? Hop over to this beautiful post by Hungry Happenings. Disclosure – I created this post in partnership with Wilton. Partnering with brands I love allows me to provide you with high quality content at no cost to you. I only work with brands I use and love. All images, text and opinions are my own. 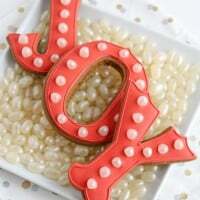 I love spritz cookies! And these are so pretty! Love the pastel colors you chose! I love the pastel colored snowflakes. What a beautiful addition to a platter of Christmas cookies! I made these on the weekend and decorated them last night with silver and gold sprinkles to match my “glam” Christmas theme this year. They are so cute! These are just so completely JOYFUL. <3 Unicorn approved!